ForexNewsNow – XEMarkets is a major online broker operating in many countries and giving a large selection of trading possibilities to its users. The company was established in 2009, then under the name of TradingPoint. Later, with the addition of several new services, the company has rebranded itself and is now running under the name XEMarkets. XEMarkets headquarters is located in Cyprus, where it’s also licensed by the Cyprus Securities and Exchange Commission. The company operates globally and offers more than 100 distinct financial instruments such as Forex, precious metals, energies, equities and more. As mentioned in the introductory lines, XEMarkets is located in Cyprus and is regulated by CySEC. This license guarantees that the broker is only engaging in fair business practices with regards to slippage and more. The broker is also authorized by the Financial Services Authority (FSA) of the United Kingdom. This is yet another major government organization that has the mission to supervise the online trading market and protect traders’ interest. Based on the rules required by the above mentioned regulators, XEMarkets follows strict regulations such as: segregating traders’ funds from the company’s own funds; keeping traders’ funds in reputable international banks and guaranteeing safe deposits and withdrawals. XEMarkets offers several platforms for its traders. The most important platform is the XEM MT4 that is based on the very popular MetaTrader 4 platform. This platform includes all the useful features of the MetaTrader 4 platform spiced with some extra features customized by XEMarkets. The XEM Webtrader has been designed to allow traders to access their trading accounts right from their browsers. This platform is also based on the popular MetaTrader 4, retaining a large selection of its features and navigational structure. Two additional platforms are the XEM iPhone Trader and the XEM Droid Trader which are also based on the mobile variant of the MetaTrader 4 platform. 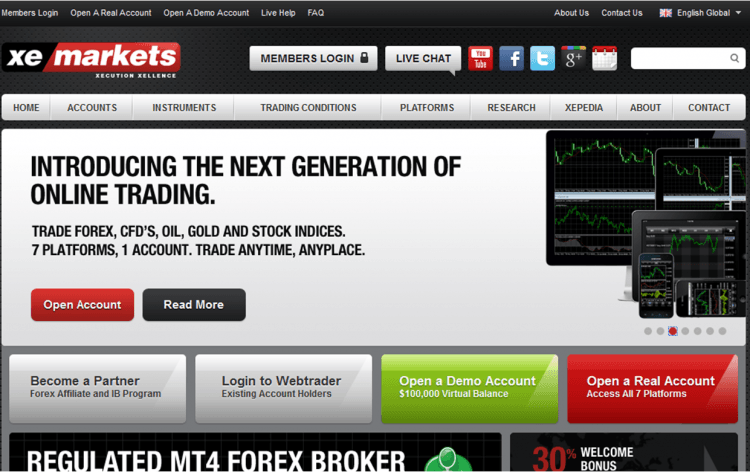 These are complemented by the XEM iPad Trader that has specially been designed for iPad users. XEMarkets offers tight spreads as low as 1 pip on the major currency pairs available. The broker has no commissions or any additional fees. Everything is well-explained and straight forward to everyone. Likewise, the same spreads will apply to all the different account types available at XEMarkets. XEMarkets also operates with both fixed and variable spreads. XEMarkets isn’t imposing any restrictions regarding fixed spreads, such as what most other online brokers do. Another attractive feature available is fractional pip pricing that allows traders to select the best prices. XEMarkets allows traders to select their leverage from a scale of 1:1 to 888:1. The broker also allows traders to request the increase or decrease of their leverage in the future. XEMarkets offers an attractive 30% deposit bonus on traders’ initial deposit. This means that the first deposit traders make will be matched with a sum of cash corresponding to 30% of the deposited sum. There are no upper limitations on the first deposit bonus. Traders will also receive a 10% deposit bonus offer on any of their future deposits. This loyalty bonus also does not have any upper limit at all. The bonus money will be added to traders’ accounts within 24 hours after the deposit. The two most used methods to contact XEMarkets are through live chat and email. Both these contact methods are available on a 24/5 basis. They are not available on Saturdays and Sundays which might be a possible drawback to some online traders. Traders are also able to contact XEMarkets through telephone but the phone numbers are usually only available during standards business hours in the GMT time zone. The customer support staff, on the other hand, is very helpful and highly competent. Traders can make deposits at XEMarkets using the following methods: Credit Card, Moneybookers, Neteller, Liberty Reserve, Bank Transfer, Western Union, Money Gram, WebMoney and China Union Pay. Deposits can be as small as just $5 and will be processed and added to the trader’s cashier account within seconds. Withdrawing money can be done with the same tools as mentioned above in the case of deposits. Traders can also withdraw amounts starting from just $5, which is usually never the case at most other brokers. XEMarkets is a solid online broker that offers a large selection of assets and instruments. Traders will be able to use the services offered by the broker through various platforms that cover regular PCs to smartphones and tablets. Traders will be able to receive highly attractive bonuses with no upper limit. Deposits and withdrawals are completed professionally allowing traders to deposit and cash out sums as small as just $5. XEMarkets is a great choice for both new and experienced traders.